The latest Audi A4 differs from its predecessor in many details, though the overall design remains faithful to the previous line of the Audi brand’s bestseller. Small changes on lights and details like radiator grill and a slight adjustment in dimensions, emphasize the sporty look and sheer elegance. This powertrain hides his true value inside, in the TDI engine of 150 HP which proved to be a perfect choice on the tested car. The total weight of the vehicle is decreased, providing better performance even with a smaller engine and less fuel consumption. We were impressed by the so called virtual cockpit, meaning a 12.3-inch screen sitting on the commanding board providing all the detailed information on speed, RPM… Incredibly useful and an aesthetically fitted solution. New Audi comes with a rich package of serial equipment, offering a safe and supple ride; the ride itself is what we enjoyed the most with this gorgeous four-wheeler. Once we got the chance to try out the latest A4 model, it was an easy decision where to test this Smooth Operator. Good roads, traffic jam-free region, magnificent landscape and diverse driving conditions with spring sea scent in the air, that is the island of Brač and its west side. We aimed at exposing you to the charms of this island even if not approached by sea. The testing conditions were perfect, enabling us a flawless ride. Having arrived by ferry, we started our test-tour in Supetar and headed up the hill towards Vidova gora. The rather wide, winding and uphill road served as the performance introductory part. Our goal was not Vidova gora, but the new road coming down from the top of the island towards Farska bay – a genuine island-mountainous ambience. New asphalt, winding roads and a magical view spreading across Hvar and Vis inhaled true ‘joie de vivre’ in our souls. The car offered us a supple and relaxed drive with beautiful control, even at the most challenging bends, our car performed impeccably, ‘forcing’ us to test his utmost possibilities. So we did and were completely surprised how smoothly A4 absorbed the road shock, offering a comfortable ride to its passengers in the middle of nowhere, with only a bewildered flock of sheep by the roadside. We were amazed by the A4’s undisturbed steering characteristics and fast reactions, even when using automatic seven-speed gear box. 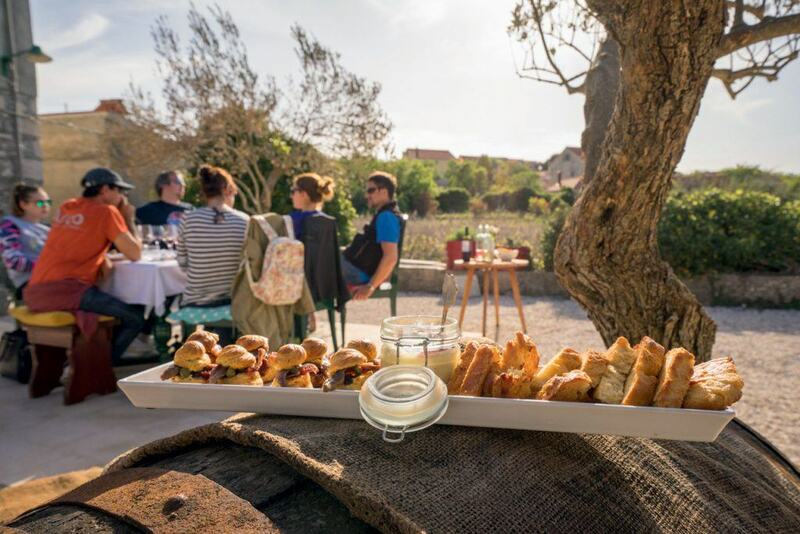 After a few hours of the leisure drive across the peak of Brač, we decided to go down and visit Škrip which hosts the island museum and a small olive oil museum located inside an old oil mill. We experienced antique and roman artefacts and premium island ‘snacks’ composed of domestic ingredients: cheese, olives, salted sardines and non-domestic, yet phenomenal prosciutto. Afternoon siesta was spent in a nearby cove Splitska sipping a cup of coffee, afterwards we took the main road, a rather busy one and headed towards Ložišća. Audi definitely provides a smooth ride under regular road conditions, causing a pleasant adrenaline rush every time we had to hit the gas. We finished our official test drive in Ložišča, posing in front of the famous church tower designed by sculptor Ivan Rendić. In the end we paid visit to distinguished winegrower Saša Senjković in his wine cellar in Dračevica, where we tasted his wines and the creative cuisine of his wife Magdalena. 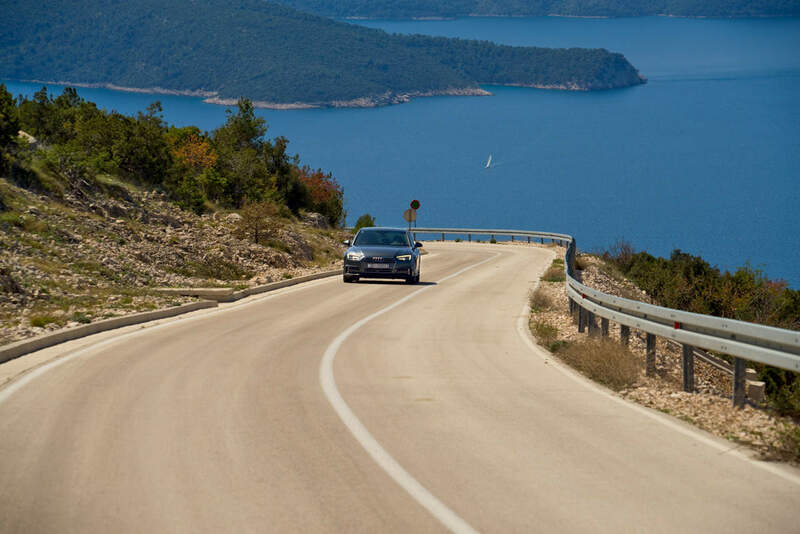 We left Brač with smiles on our faces, convinced of all A4 premium features. 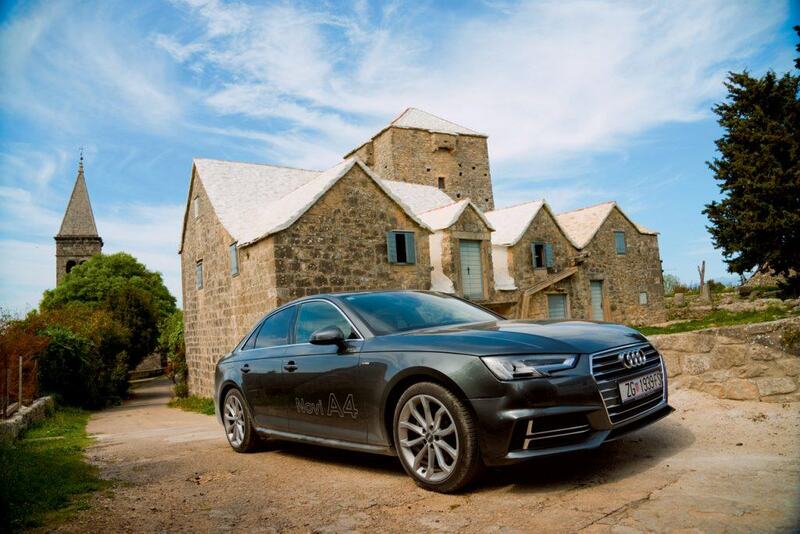 We recommend you to try out the agile ride the new A4 offers and experience Brač in a different way.